Two years ago, Mira Rai had never heard of trail running, but saw a poster for a 50km race, entered, won, and has never looked back. 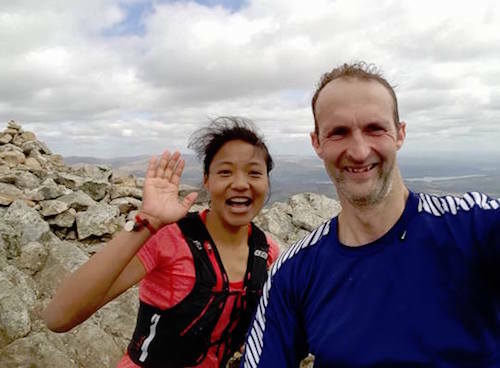 Mira has just spent a month in the UK, culminating with the Yorkshire Three Peaks race. How did she get on? Sarah Stirling catches up with her. It's a compelling story: the star ultrarunner who grew up in a remote mountain village, spent much of her childhood walking to fetch water, and then became a child soldier because she was so desperate to broaden her horizons. Now a member of Salomon's elite sponsored trail running team, Mira first came over to the UK on 1 April for the Salomon Advanced Week, where their athletes meet up for a pow-wow and gear testing; this year it was held in the Lake District. SS: Namaste! Have you had a pleasant month in the UK? MR: Yes, I was really happy and surprised by the overwhelming support here. A very friendly environment. I think you visited the Lake District first – what did you think of it? I didn't find steep mountains, but very mild hills, and the weather was really fast changing. I found very beautiful wide views of many little lakes. People are very friendly and helpful, and they looked like Richard Sir. Congratulations on coming second female in the Three Peaks race. How did you train – year after year local knowledge has proven the key to success, especially as you have to navigate your own route? I didn't really get much time to train for the race as I had a visa problem and had to go to Calcutta in the week leading up to the race, then to Italy to get a new visa for the eurozone. Definitely not adequate training! I was unable to train as much as I wanted to, but did run a little with local runners. Oh no, sounds stressful! And very impressive to have come second. It was a really stressful week as there was a point we thought I wouldn't be able to run the Three Peaks at all. How did you find running on the slippery limestone? I had some difficulties running on the slippy rock but I enjoyed it very much. I was very optimistic. I fell over coming down one of the peaks, flat on my face, but I managed to get up and keep running! Nice work! What are your key strengths as a runner? My key strength as a runner is that I can easily adapt to different environments: also I have grown up running up and down hills at altitude, which helps! Mira is available to watch via Vimeo on demand. Proceeds go to showing this film in remote places with a mobile cinema, to girls who would potentially be inspired by watching Mira’s film. The trailer is below. You’ve talked of becoming a mentor to female runners in the future – tell us a bit about this idea? I want to utilise all the skills and knowledge I have acquired through training with athletes from all around the world and invest this in young runners who may be hidden away in remote villages all around Nepal; to give more credit to them and promote the sport of trail running in Nepal. That's a great goal. It sounds like a dream to fly about the world racing! I am loving going around the world representing Nepal and trying to do my best to keep my country and the people proud. The support and response I have had from lovely people all around the world is just overwhelming. Sometimes I feel like it is all a dream. I am dreaming a beautiful dream! Without the support of my karate guru and my trainer manager Richard I don't think I could ever have got to where I am right now. I owe all my credit to all my supporters. Two years ago you had never heard of trail running – what does running now mean to you? My whole life I had basically trained myself for running, by doing the normal day to day chores in my village of running up and down to get water and things like that. Now trail running has given me a new life, and new opportunities that I never imagined. Will you come back to the UK? Any plans for more races here? I'd love to go to Scotland that I heard is even wilder than Yorkshire and the Lake District, maybe race at the Glencoe Skyrace one day. I hear that is a crazy race. SS: How did you meet Mira? AJ: I met her through a friend on the Salomon Advanced Week a few weeks before the race. I live in Yorkshire and she said she'd like to run on the Friday before the Three Peaks race, so I suggested the Coniston Horseshoe. What was she like and how did she get on with the terrain? We ran 20km and she was very friendly and never stops smiling. She said she loved the Lake District mountains, especially the rocky sections. I mentioned to her about how the limestone here in Yorkshire would be slippery during the race, especially if wet, but it didn't seem to phase her at all. As a runner she is very strong, especially climbing. When she descended rocky sections she was so light on her feet it was as if she was dancing! I gave her some tips about the terrain for the Three Peaks, and on race day pointed out where the water stops were. She did really well to come second! Yes, especially as, unlike European races which are marked, you need to navigate on the Three Peaks. Having not run it before she wouldn't have known the best lines. So second was amazing, especially as she had to fly to India and Italy the week before the race, and she had a nasty fall off Whernside and cut both her knees. But she is very, very tough! She is very inspiring and I feel very privileged that I can call her my friend now. The land of the Bob Graham Round turned out to be both the ultimate S-Lab testing-ground and the ultimate playground for Salomon's pro athletes François D'haene, Emelie Forsberg, Anna Frost, Kilian Jornet, Ryan Sandes, Max King, Rémi Bonnet, Yngvild Kaspersen, Ellie Greenwood and Mira Rai. READ: Ed Douglas interviewed Mira in the last issue of Summit magazine. Get the adrenaline buzz of reaching the top. Keep fit without feeling like you're doing exercise. Socialise and build strong friendships. Tempted to give climbing a go? Find out more about This Girl Can Climb. “After that I relaxed and enjoyed the last 10 hours even though my feet were full of blisters.” At 7.56am on Monday 2 July, Nicky Spinks became the first person to tick off a double Ramsey Round. That's right, she ran the classic British fell running challenge, which takes in 58 miles and 24 peaks including Ben Nevis, twice. It took her 55:56:38. Sarah Stirling interviews.